Episode 127 is here! It starts with the Quick Hits! Like always. They include con appearances, toys, a book, and more! Time for episode 125! We have some big news this week! Like 4DE plushies finally shipping, a possible guest star for a future episode, and the movie's release date! And so much more! Hello listeners! It's time for episode 124! Last week's Quick Hits section was massive, but we've got a smaller one this time around. This week we have a new fan game, new comic announcements, and worrying new from John de Lancie. Pony 411 Episode 123- We Can Count! Hey there! Welcome to episode 123! It's revenge of the merchandise in the Quick Hits this week. Some of it includes new books (one with a possible spoiler), plushies, action figures, and more! Hey there listeners! It's time for episode 122! It's a bit of a shorter one, but we still have a selection of news to kick it off. It includes such items as Lauren Faust attending another con, a fan game getting released, pony heads (what? ), and more! Pony 411 Episode 119- What's That Light? Time for episode 117! It's a double header this week. But first we have small amount of news, including Them's Fightin' Herds, a figure you probably can't get, and a leak! Episode 116! We have more Rarity this week. But first, some news! Like an alarming reply from Hasbro Studios when a little girl wrote them, new comics coming, a soundtrack, more episode announcements, and much more! It's episode 115, and the hiatus is over! But first, we have a small helping of news for you! This week there are some con guest announcements, a new plushie being released, some season 5 teasers, and more! Episode 114! The one before season 5 comes back! The news has been a bit slow, but there's still some to talk about. Like new Build-A-Bear plushies, Mane6 revealing the name of their fighting game, another season 5 episode being revealed (and proving Nemesis completely wrong), and more! 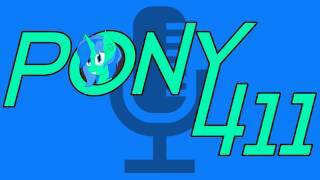 Pony 411 Episode 112- No Ponies?! Episode 112 is here! And it brings news! Some of this news includes several fan videos, some bits about Friendship Games (including videos), William Shatner (not a video), and more! It's time for episode 107! And summer! This week in the news, we have new pony toys arriving in stores, some new comics, and a possible release date for "Friendship Games!" And more! Time for part 2 of our EFNW show!